Let the new IGLOO contest! And mini-Contest begin! Hey everyone the new edition of Better Igloos is out! So lets decorate our places till’ we can decorate no more! 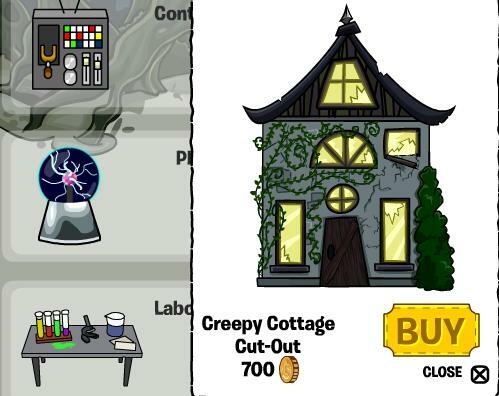 First of all we’re going to need to know the hidden furniture so we can get extra style points in the current official CP igloo contest, and in our little one! Well what’s Halloween without an organ? 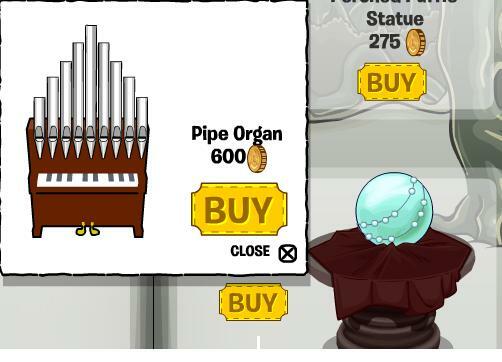 Click the ultra awesome crystal ball’s beads and then a pipe organ will become available to you for six hundred coins! Now your looking around, crystal ball, pumpkins, organ, there’s still a few things missing, What’s Halloween without a cauldron to make your witches brew? 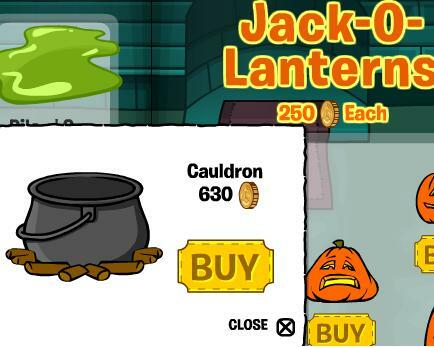 click the O in Jack ‘O lantern to have a 630 coins cauldron pop up! So now you want some cutouts, there aren’t many, Oh look at this control panel do-hickey it’s sure to have a hidden item!, No such luck, you look at the plasma ball, you click the pink dot and jump with joy! I have to admit there is some cool stuff in this issue. Click the top circle thing on the modern art sculpture to find the rock wall. Click the disc on the dj table to find the drum kit. Click the bottom speaker on the speaker to find the quarter note. Click the eighth note to find a music stand. Lots off cheats this month! So down to the fun part, IGLOO CONTEST! I’m having a just for fun igloo contest, Grand prize winner will have their penguin name posted on my site, a picture of you and your igloo will be posted, and you will be added to my blogroll for a month (If you do not have a blog or are already on my blogroll you may buddy my penguin!) 1st prize winners (3) will have a picture of their igloo and their penguin name posted on my site, honorable mention (at least 2) will have their penguin names posted. I will need at least ten penguins for this contest to happen and if I have less I will have to cancel, You may enter up to two penguins, but most likely only one will win grand or first prize! This is more of a “for fun contest” but if enough of y’all enter we can have more! I thought it was pretty awesome! What do you think? It’s getting closer – the party so many of you have been looking forward to! Last year’s Music Jam was a really big success because of all the ways you got involved. There were band practices everywhere, and cool music performances all over the island. This year’s Music Jam will go from July 17 – 26, and if you rock Club Penguin anything like you did last year, it’s going to be an even bigger and better party. There will be lots of stages (with different kinds of music for everyone), and just like last year, members will get a chance to purchase an All-Access Pass. We’ve heard rumors about some musical penguins making appearances – and about other surprises, too! It’s the perfect time to start getting ready, so grab your guitars and some friends, and find a good spot to make some noise. Be sure to let us know how your band rehearsals are coming along!